Continuing on my Tokyo series, here, I’ll talk about the very famous district of Ginza. 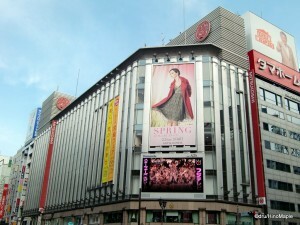 Ginza is famous for being an upscale shopping district in Japan. It’s is always compared to 5th Avenue in New York, Oxford Street in London, and Champs Elysees in Paris. The shopping is top notch with the biggest name brands located within this small area. To give you an idea, you can walk the perimeter of Ginza in about two hours. Ginza is bounded by an elevated highway, which makes it easy to know when you leave Ginza. While the south-east border has an underground highway, it’s still easy to tell the border as there is a huge street to cross. The heart of Ginza has to be 4-chome (yon-chome). Whenever you see pictures of Ginza, you are probably seeing 4-chome, or a picture very close to it. Taking the train to Ginza is also relatively easy. Finding 4-chome is also easy, but you can easily get lost at the same time. Thankfully, there are several maps in the underground area of the station, but once you find it, it’s easy to explore Ginza. 4-chome, as I said is the most famous intersection in Ginza. Running north-east to south-west is Chuo-dori. It’s the main strip for Ginza. On weekends and national holidays, the street is usually closed to traffic to allow pedestrians a wide space to enjoy their shopping. Many local merchants also set out tables and chairs so you can have a nice rest in the sun, if it’s sunny. Running north-west to south-east is Harumi-dori. It’s a very busy street with relatively fewer things to see, but still a good destination. 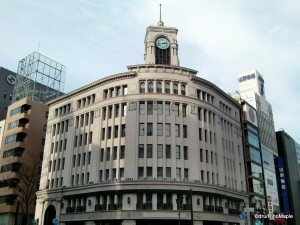 On the North corner of 4-chome is the department store Wako. It’s famous for its high prices and extreme luxury. It’s a nice place to take a quick look at things you could never afford, unless you are very rich. For something reasonable, exploring into the North, you’ll find Printemps which is a popular department store for younger women. 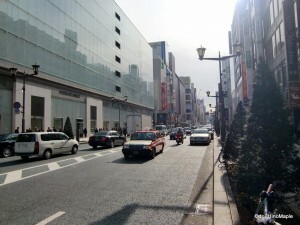 The entire North side of 4-chome is full of expensive luxury shops that have both no name shops and brand name shops. It’s a wonderful area to just walk around and explore the many different shops. There are also several mid range to expensive restaurants in the area. Notable shops include Gucci and Emilio Pucci on Harumi-dori, and Kimuraya (bread shop), Chanel, Cartier and Apple. The East side of Ginza 4-chome is probably the most popular, in terms of shopping. On the corner, you have the Mitsukoshi department store. Next door, you have the Matsuya Ginza department store. Both are relatively the same, in terms of what they offer. They both have large underground food shops where you can buy a lot of delicious Japanese and foreign foods. It’s a must see for most people. Behind Matsuya Ginza, you’ll also find the first Starbucks in Japan. It’s a relatively small building, but the coffee is cheap for the Ginza area. If you continue past Matsuya, you will run into Bvlgari, Tiffany & Co., and a large stationary shop called Itoya. You can find almost any type of pen, pencil, or even painting accessories. It’s a must see if you like stationary. Travelling south-east into Higashi Ginza (East Ginza), you’ll reach the Kabukiza. It’s a famous kabuki theatre. Kabuki is an old style of theatre that is akin to the old Shakespearean theatre of England. It’s an all male cast and tickets for the upper deck are relatively cheap. You can even rent headsets that will give you information as to what is happening. I hear it’s a wonderful place to visit on a lazy afternoon, but if you don’t have the time, it’s probably nothing you’ll cry about. This is the end of Part I of this two part series. The second part is available at PART II. This entry was posted in Tokyo and tagged 4-chome, 4chome, 5th Avenue, apple, apple store, brand name, bvlgari, cartier, Champs Elysees, chanel, chuo-dori, Chuo-ku, chuodori, depachika, department store, emilio pucci, food floor, Ginza, Ginza Station, gucci, harumi-dori, harumidori, itoya, japan, kabuki, kabukiza, kimuraya, luxury goods, mastuya, mastuya ginza, Mitsukoshi, Oxford Street, pedestrian paradise, printemps, shopping, stationary shop, theatre, tiffany & co., tokyo, Tokyo-to, wako, yon-chome, yonchome by Dru. Bookmark the permalink.